The Maharathotsava, organised as part of Deepavali was held with religious fervour and in grand manner at Malemahadeshwara Hills yesterday. Lakhs of devotees from various parts of the State including neighbouring Tamil Nadu thronged the temple to offer special prayers. Abhishekha for idol of Malemahadeshwara, the local folk hero, bilvarchane, and other rituals were performed by temple priests. The pujas began from 4 am. 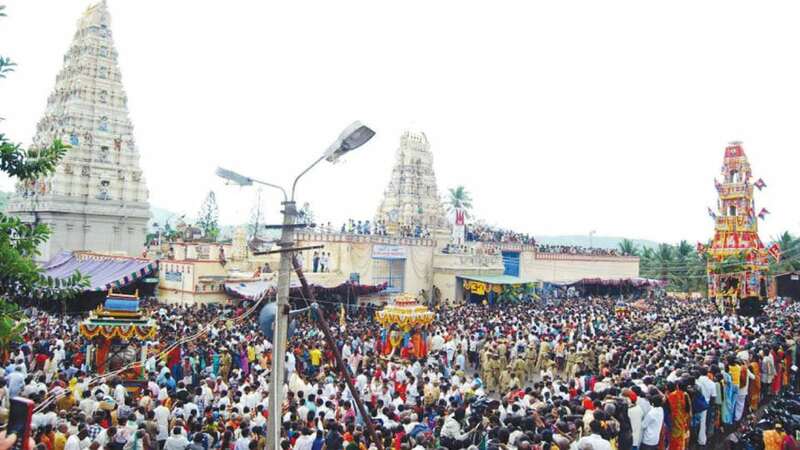 Devotees pulled the chariot after Kalasa carrying 101 women belonging to tribal Bedagampana community performed arathi as per tradition from several decades marking the beginning of the festival. Salur Mutt seer performed special pujas to the deity before it was installed on the huge Rath, which was taken out in a procession. Later, the procession deity (utsavamurthy) of Mahadeshwara was taken out in a procession inside the temple premises. The Rathotsava which commenced at 8 am concluded at 9 am after going three rounds around the temple. Devotees pulled the chariot chanting slogans Ughe Ughe Mahadeshwara. They also offered various grains, harake, banana, other farm products to the deity. Folk troupes accompanied the procession, performing Goravara Kunitha, Veeraghase, Tamate Nritya, etc, adding glitter to the festival. The three-day jatra which began on Tuesday concluded with the Teppotsava on Thursday night. The Car festival was celebrated under the guidance of Saluru Mutt Seer Sri Guruswamy. Executive Officer of Male Mahadeshwara Development Authority K. M. Gayathri, Deputy Secretary Rajashekharamurthy and Superintendent Basavaraj were present. The Karnataka State Road Transport Corporation (KSRTC) had provided additional bus services from Chamarajanagar, Kollegal and other places to the temple town. 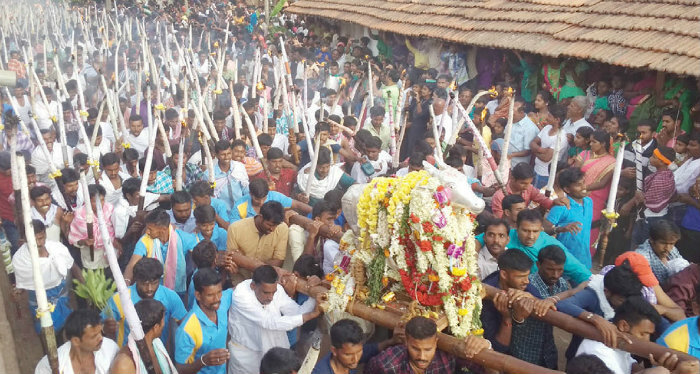 The procession carrying Bettadashri Shidlu Mallikarjunaswamy Utsavamurthy was also held with all religious fervour at Bettadapura in Periyapatna taluk yesterday. This ritual was conducted as part of Deepavali festival. The procession began after local MLA K. Mahadev and his wife Subhadramma offered puja to Utsavamurthy. Thousands of devotees carrying torch light in their hands took out the procession at Bettadatunga and other surrounding villages of the hill. Residents and women welcomed the Utsavamurthy by decorating the streets of their villages with flowers and colourful rangolis. A mass feeding was organised by members of Bettadapura Veerashaiva Samaja. Are all the saplings planted on Environment Day growing?